“How could a phone be a shrink?” This question drove my research at Intel in 2006 and led to a prototype we called the Mood Phone. I knew the idea flew in the face of an implicit tenet of therapy: that unmediated interpersonal dialogue was essential for it to be effective. But I also knew that the traditional model of therapy was constrained by the technological limitations of the age in which it first developed. I spent the better part of a decade training to become a clinical psychologist. I saw how powerful individual therapy can be, but I also knew that the “talking cure” — the late-19th-century paradigm of an extended dialogue between a therapist and client held in a setting removed from the client’s everyday life — didn’t scale. A good therapist is expensive, physically distant, and available by appointment only. Our problems occur in the mix of our lives, unscheduled. So I began the Mood Phone effort as an experiment with colleagues at Intel and Columbia University. The Mood Phone was an app designed to serve as a personal therapeutic agent, with interactive prompts rooted in the psychological principles used by therapists, specifically cognitive behavioral therapy. We wanted to offer individuals a digital therapist at their disposal. The Mood Phone integrated sensors, calendar prompts, and self-tracking data to detect emotional changes. It offered visual and verbal cues to help individuals navigate their problems in real time. One of the early hints that this tool would be more than a private therapist in your pocket came from a participant named Chandra, who told me how she used it to manage a toxic interaction. She had walked into a bar to meet friends when she heard one of them bad-mouth a mutual friend who wasn’t there. It got uglier and turned into a character assault. Chandra checked her Mood Phone and saw that it happened to cue up a helpful rhetorical question, which she showed to her friends: “Might I be villainizing?” Villainizing, an extension of tendencies to see the world in black-and-white terms, is part of an attributional style associated with hostility. By holding up a mirror in this way, Chandra interrupted the attack on her friend and perhaps even encouraged some self-reflection among her friends in the bar. Chandra had taken a technology carefully designed for one purpose and extended its use for another. She had turned it into a social tool appropriate for her situation. Perhaps much of the concern about communications technology came from an assumption that people would use these tools exactly in the way that the designers had anticipated. What if we looked at how people are making these tools their own, going beyond the expected uses? What if we looked more fully at how these tools are being used in the complex social situations of daily life? I suspect that the value we get from technology similarly depends on how we challenge it and let it challenge us. In the years since that project, I have experimented with many other ways of bringing what psychologists know about emotion, communication, and health into the technologies people use throughout the day. I have also watched the ways individuals use popular products, such as ride-sharing, messaging, gaming, and augmented reality, often in unexpected ways. Some used smart lights, intended for efficiency, to signal to their partner when they were upset; others used augmented reality not for gaming but to cope with social anxiety and to help plan complex medical treatment. The lesson I first learned from Chandra — that benefit often comes as people break or expand the rules to depart from the intended usage — has played out repeatedly. I have seen that our relationship to technology and the benefits we reap from it depend on how much we make it our own. This has motivated me to contextualize the drumbeat we hear about the perils of technology, particularly social media: increased isolation, difficulty empathizing, and impaired conversational skills. Sherry Turkle’s compelling TED Talk about the isolating effects of technology has been viewed more than 4 million times. This talk resonates with a desire for more connectedness, along with a growing concern about the distraction we see in ourselves and others. Most of us rely on communication technology, especially the messaging, social networking apps, email, and voice services on our phones, for connectedness with family and friends. This connectedness, through whatever means it is sustained, is vital. I suspect most people reading this have suffered through periods of feeling isolated or know someone who has. Loneliness is common, particularly among those under 18 and over 65, and poses health risks (for example, dementia and heart disease) that are comparable to obesity and smoking. Like other health concerns, loneliness may spread within social networks. It is obviously not the case that all communication works against loneliness, that every glance at Facebook or every composed email cultivates feelings of belongingness or closeness. Nor is it clear that phones, social media, or the internet cause isolation. To the contrary, some research associates internet use with increased communication and social satisfaction. For those who are extraverted, these channels offer additional contact, and for those who are socially anxious, texting and online communication lower the barriers to communicating. Many teens and kids find friendship as well as acceptance through social media that is unavailable in their local communities. Online communities are often especially critical for teens who feel ostracized due to their gender identity and sexual orientation. I broaden the definition of social media to include all the technologies we use to connect — whether that is with fleeting acquaintances, close friends and family, or larger communities. Thought about this way, social media extends well beyond social networking sites, messaging, and email. Even reminders from voice assistants are used interpersonally. Take the example of a father who has trouble enforcing time limits with his young kids. When he simply tells them they have five more minutes of playtime, the end of that time seems subjective. He may announce that time’s up at five minutes or maybe 15. Regardless, his daughters resist and wiggle for more time. Lately, he’s been calling in reinforcement, saying to his home device, “Okay, Google, let’s set a timer for five more minutes of playtime.” This makes it official. When the timer goes off, he is not the bad guy. A related exchange played out between two brothers who had grown apart. The younger of the two, Paul, recently sent his brother, Roger, a voice message through the Alexa app in which he sang a song they laughed about as kids. This endearing exchange took an amusing turn when the smart speaker in Roger’s kitchen, which was playing Paul’s message, apparently took Paul’s singing as a cue to play the original version of the song. Roger was suddenly transported decades back to a time when he and his brother often laughed together about this silly song. Rather than regarding technology as an external force or temptation that we have to struggle against, I propose thinking about the alliances we form with technology. This alliance begins when we acquire or access something, perhaps a new device, service, or data, and evolves as the technology challenges us and we challenge it. We bring the technology into social situations it wasn’t designed for. We draw on it to negotiate the limitations we see in ourselves. In exploring new applications for it, we find new perspectives on ourselves and our social worlds. In suggesting that we ally with technology, I am adapting the concept of the therapeutic alliance — the collaborative bond between patient and therapist that has been identified as a critical element of treatment. This alliance develops in part from mutual challenging: The therapist questions aspects of a patient’s life story that may limit her expectations for the future; the patient critiques the therapist’s interpretations and the process. I suspect that the value we get from technology similarly depends on how we challenge it and let it challenge us. 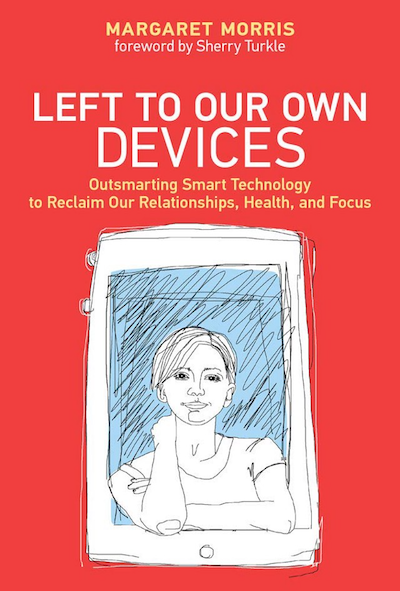 Excerpted from Left to Our Own Devices: Outsmarting Smart Technology to Reclaim Our Relationships, Health, and Focus, by Margaret Morris, with a foreword by Sherry Turkle, published by the MIT Press. All rights reserved. 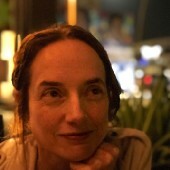 Margaret Morris is a psychologist, technology researcher and author of Left to Our Own Devices.